In this tutorial, we will learn about how to use Hibernate Many-To-One Bidirectional mapping using annotation based configuration. Schema layout for Many-To-One Bidirectional mapping is exactly same as Many-To-One Unidirectional Mapping. One table has a foreign key column that references the primary key of associated table.In Bidirectional relationship, both side navigation is possible. We are discussing an example of Student and University relationship. Many student can enroll at one University. And one University can have many students. Let’s get going. Here we have first created University table followed by student table as student table contains a foreign key referring to University table. Please visit MySQL installation on Local PC in case you are finding difficulties in setting up MySQL locally. On saving pom.xml with above content, Eclipse will download all the dependencies. 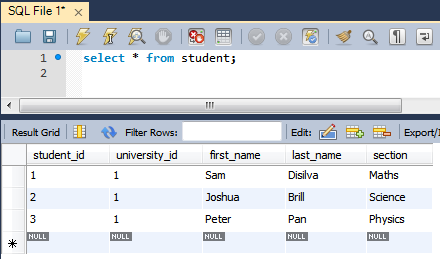 Model class Student & University are simple POJO class which is annotated with JPA annotations to map it to a database tables(created in step 1). return "University [id=" + id + ", name=" + name + ", country="
@OneToMany on list property here denotes that one University can have multiple students.With students property defined in University class, we can now navigate from University to students. 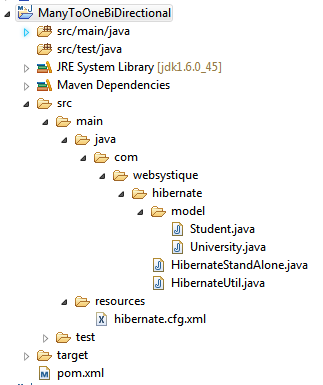 mappedBy says that it’s the inverse side of relationship.Also note the cascade attribute, which means the dependent object(Student) will be persisted/updated/deleted automatically on subsequent persist/update/delete on University object.No need to perform operation separately on Student. @JoinColumn says that Student table will contain a separate column UNIVERSITY_ID which will eventually act as a foreign key reference to primary key of University table. @ManyToOne says that multiple Student tuples can refer to same University Tuples(Multiple students can register in same university).Additionally , with optional=false we make sure that no Student tuple can exist without a University tuple. This class is well-known in hibernate community, and used for configuring hibernate on startup and managing session factory. // property of University class. 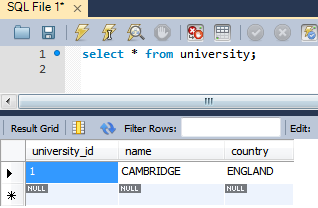 You can see that we have updated both the student and university object with there associations but we have only saved university explicitly.Since we have cascade attribute set to all on student list of University, all child objects(Student) will be saved on persisting parent object(University). Below is the snapshot of MySQL database after execution of above program.